The buzz in Washington this week is all about Senator Richard Lugar of Indiana, the ranking Republican on the Senate Foreign Relations Committee, and his speech Monday night about Iraq. Lugar isn't ordinarily a topic of lively conversation — except when he bails on President Bush on the "surge" in Iraq. Then he gets attention and deservedly so. He is not a hot dog or a partisan blowhard or a politician worried about re-election. He's serious and levelheaded. And wrong. In the speech, Lugar declared there's not enough time for the surge — the counterinsurgency strategy devised by General David Petraeus to secure and pacify Baghdad and Anbar province — to work. Instead, he proposed a "thoughtful Plan B," which consists chiefly of diplomacy, economic aid, and a "downsizing and re-deployment" of American troops. Here's his key sentence: "The prospects that the current 'surge' strategy will succeed in the way originally envisioned by the president are very limited within the short period framed by our own domestic political debate." Lugar makes two major mistakes in his speech. The first is obvious: the surge hasn't had a chance to work. The troop buildup was just completed this month and the strategy is only now being fully implemented. And Petraeus won't report on the progress of the new strategy until sometime in September. Yet Lugar says it won't succeed because of "political fragmentation" in Iraq, "the fatigue of our military," and constraints imposed the "political process" back home in Washington. Maybe he's right, but we won't know that for months. His second and more important mistake is misunderstanding the effect an American pullback in favor of a diplomatic offensive would have. Lugar insisted the new approach would help achieve America's "four primary objectives" in Iraq. These are: preventing the creation of a terrorist haven, curbing sectarian violence, preventing Iranian dominance of the region, and "limiting the loss of U.S. credibility in the region." These are worthy goals. The problem is his Plan B would not achieve them — quite the opposite. It's the surge that's designed with these four goals in mind. 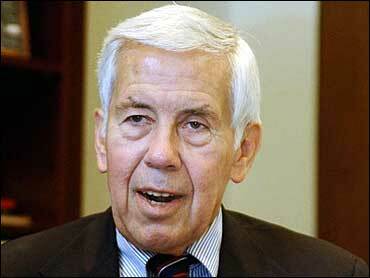 Abandoning the surge strategy would cause the opposite of what Lugar wants. It would leave al Qaeda and Baathist diehards with a staging area, either inside or near Baghdad, for their attacks. It would mean sectarian violence in Baghdad and elsewhere would increase, particularly because Iranian agents would be free to provoke it. Iran's role in Iraq would grow. As for American credibility, Lugar's plan would have the same impact on it that the pullout from Somalia had in 1993 and the retreat from Lebanon a decade earlier. Our credibility would plummet. Al Qaeda would gloat and declare victory. Lugar said a smaller American force in Iraq would be available to deal with terrorist threats, protect the oil pipelines, and "help deter a regional war." But why would a smaller force be able to do this when the current larger U.S. force has its hands full with these same goals in mind? He doesn't answer that question. He can't. His strategy simply doesn't make sense. The heart of his Plan B is diplomacy. "A diplomatic offensive is likely to be easier in the context of a tactical drawdown of U.S. troops in Iraq," he said. "A drawdown would increase the chances of stimulating greater economic and diplomatic assistance for Iraq from multilateral organizations and European allies, who have sought to limit their association with an unpopular war." But would these groups and "allies" really want to jump in as American troops are standing down and the prospects for chaos, especially in Baghdad, are increasing? I don't think so. And do Syria and Iran really have a constructive role to play? So far, what we've seen from them is a consistent strategy of promoting disruption and violence and instability in Iraq. Like other Republican senators, Lugar is impatient. The war is unpopular and victory is not in sight at the moment. Senate Republican leader Mitch McConnell has said he expects President Bush to adopt a "new direction" in Iraq this fall. If Bush does and it resembles Lugar's Plan B, we'll be in far deeper trouble in Iraq and the region and for years to come.